I have to believe that the name is miss-spelled vonDohln on the bottle. 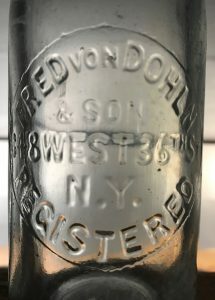 There is a Fred vonDohlen listed as a grocer in the 1897 Trow NYC Business Directory at the same address that’s embossed on the bottle, 348 W 36th Street. He was also listed in every NYC general directory I could find between 1876 and 1909 and always at that address. Interestingly enough the 1900 Directory (and only this Directory) lists him as Fred vonDohlen & Son (as embossed on the bottle) and lists him as water not grocer. All other directories list him as a grocer (and no & Son). The 1900 census records recorded a Fred vonDohlen living at 348 W 36th Street so it appears that he operated a small grocery store and probably lived above or in the rear of the store. He had four sons, the oldest of which, Karl, listed his occupation as clerk. I assume he was the clerk in his father’s store and is the son referred to on the embossed bottle. The other three sons listed unrelated occupations. Looks like he was in business from at least 1876 to 1909. He could have been in the bottling business that whole time as well or maybe he gave it a go with his son for a year and it didn’t work out? The current building at 348 W 36th St was built in 1936 so it doesn’t date back to the time frame of the business. The adjacent building is older and may go back that far. The bottle I found has a tooled blob finish (8 oz) that probably dates to the latter half of the business time frame, including 1900, the year he was listed in the water business. I’ve yet to see one of these bottles anywhere on the Internet. Previous Previous post: J. H. VanBrunt, Far Rockaway, L. I. Next Next post: W & T, 57 Downing St., N.Y.